Well, today is Valentine’s Day. Either a marketing creation designed to push product in the doldrums of winter or a special day to celebrate love — depending on how you look at it. Either way, it turns out, there is a fundamental similarity between love and marketing. As we learn from the data in today’s chart, relationships thrive when you put the interests of the other party above your own. How important is it for you that the marketing of a company that you do business with puts your interests before its own? To see 27 more charts from the study, download the free report. 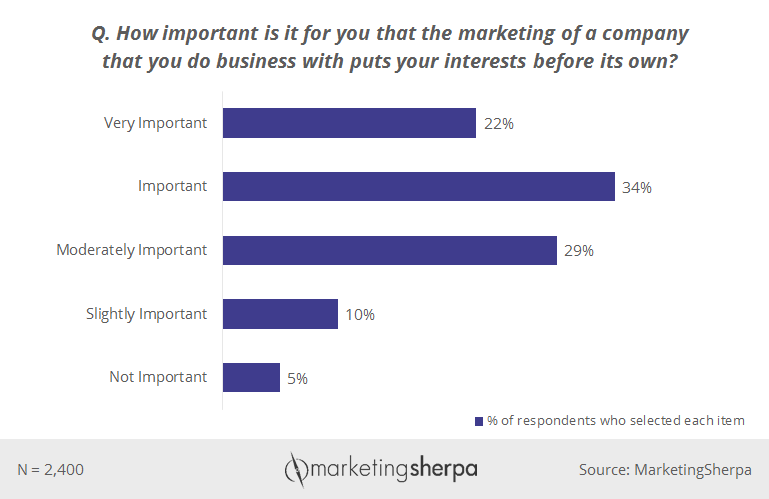 As you can see from the data, customer-first marketing is important to a majority of consumers, with 22% considering it very important. In fact, only 5% of customers consider the practice not important. This shouldn’t be surprising. In any relationship, whether with a spouse or with a brand, people do not want to be taken advantage of, and they want to feel that the other party prioritizes their needs. 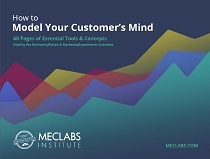 To better understand the voice of the customer on this topic, here are a few direct customer statements from the survey about customer-first marketing. Qualitative statements tend towards the extremes (and no one is an extreme moderate), so I don’t want to dishearten you on the state of marketing with these statements alone. Keep in mind that, according to our data, 92% of Americans said at least a few companies they interact with practice customer-first marketing. That said, let’s not ignore them or sweep them under the rug. What can we learn from these direct customer statements? This isn’t to suggest that you should run ads saying how horrible your product is. In reality, your product or service is probably the right solution for some people (or it wouldn’t exist), just not the right solution for everyone. Which addresses the concern in the last quote — finding the groups of people that want or need your product and focusing your marketing efforts on them. Ah, the joy of being a marketer in 2017. With so much data. And technology. Segment more granularly to get a better understanding of the user’s behavior — did they just buy that pair of jeans you’re about to serve them an ad for? Did they just increase their cart value? Manage channels holistically — including setting the right frequency at which you deliver ads —so you deliver a coordinated conversation to consumers across display, mobile, video and other channels. Gain an understanding of identity across devices so you know with whom you are trying to communicate. Utilize dynamic creative optimization to serve tailored messaging based on specific data points that dictate the best combination of elements in the creative. “Remember: A user equals a human. Really try to understand what they are looking for and what they want. It’s not enough to not be creepy. The humans you are targeting should like your advertising. That’s how you gain trust, loyalty and, ultimately, business performance,” O’Connell said. Marketing Chart: Does customer-centric marketing fall short of satisfying the customer?